Designed to meet the stringent requirements of scheduled business and personal transportation, the Piper Meridian combines the most advanced Garmin avionics available today with the reliable, proven Pratt & Whitney PT6A-42A turboprop engine, resulting in an airplane up to the challenges of your most demanding mission profiles. Turboprop power. 1,000 nm Range. 260 ktas Cruise Speed. Flight Into Known Icing (FIKI) approved. Strong takeoff and landing performance, especially in hot and high conditions. The ability to climb to altitude quickly and efficiently topping most weather and turbulence. These are some of the attributes that Meridian owners and pilots enjoy in their day-to-day flying. Passengers enjoy the low noise and vibration levels of the Meridian’s turboprop engine, the comfort of a pressurized, air-conditioned cabin environment and seating similar to that found in aircraft costing twice as much. And you will enjoy the Piper Meridian at a million dollars less than its closest competitor. 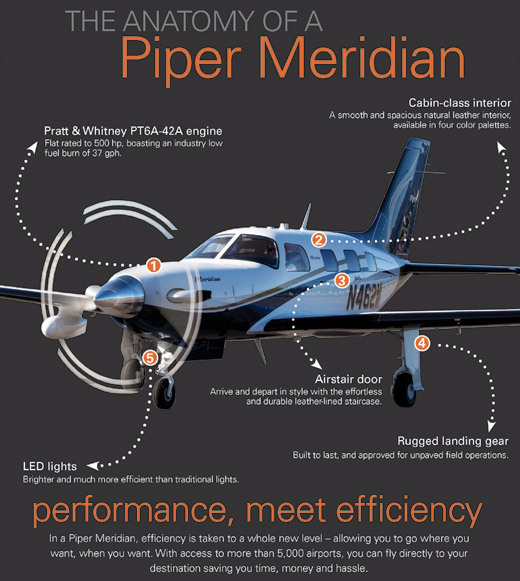 With the Piper Meridian, stepping up to turboprop power doesn’t mean stepping up to unreasonable high acquisition costs. As a matter of fact, the Meridian is nearly $1 million less to purchase and 30% less to operate than its nearest single engine turbo prop competitor. As you review the specifications below, be comfortable in the knowledge that you’re getting the maximum amount of turboprop aircraft for a minimum amount of cost.